What does your family do for Christmas breakfast? I love to cook, I really do. And I’ve had this crazy idea that the more I cook and the more lavish of a meal that I cook, the more I show my family I love them. For years, my husband has been trying to get me to make Christmas breakfast simple, but he never quite succeeded. When we were first married, he tried to get me to just buy a can of Pillsbury orange rolls. That lasted for about ten years but we haven’t had any of those for a long time. I just can’t help it. Breakfast is one of my favorite meals and there’s so many wonderful recipes to choose from. Who wants canned food on Christmas? I think breakfast is our family’s favorite meal anyway. When I married my southern bred husband, he introduced me to a whole new section of breakfast cuisine. 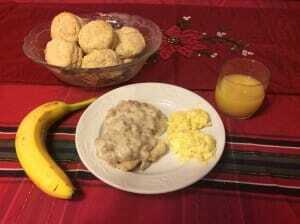 In spite of its cholesterol choking capabilities, biscuits with sausage gravy is a family favorite. I justify making it by using skim milk in the gravy and sneaking a couple of tablespoons of whole wheat flour into the biscuits. I’ve discovered I can make the biscuits and the gravy the night before. Then on Christmas morning, all I have to do is toast the biscuits in the toaster oven and warm the gravy in the microwave. Sure, it isn’t quite as good but hey, the family is thinking about the presents, right? Somehow I just don’t seem to have the time for what I really like to make – homemade cinnamon rolls. Christmas Eve services at the church where my husband pastors is the highlight of our holiday celebration so by the time we come home from that, I don’t have much energy left to do anything too elaborate. Another favorite is Sausage Egg Bake. I can quickly put that together the night before. Just as the family wakes up, I’ll stick it in the oven. We then have enough time to check Christmas stockings, read the Christmas story and do the finishing touches on breakfast. We eat, and then open the rest of the presents. Stir together the dry ingredients. Cut in the shortening. Add the milk all at once and mix well till dough clings together. Knead gently ten strokes on a floured surface. Pat out dough with your hands to ½ inch thickness. Cut out biscuits with a biscuit cutter or cut into wedges like scones. Transfer to an ungreased baking sheet. Bake at 450 till golden brown, 10-12 minutes. Over the years, God has had to work hard on my attitudes about food at holidays. I’ve had to remember that food is only a tool, only a part of the entire celebration, that the focus is Jesus Christ, not the food. Every year breakfast cools while my husband reads the Christmas story, I have to remind myself every year that Christ taking on human flesh so that he could atone for the sins of the world was far more important than a lavish breakfast. I know that sounds like a well duh, but for me it has been a struggle. That’s why I wrote the story, “The Christmas Gift” that will be included in the anthology, Christms Treasures: A Cellection of Short Stories.. Jen, in her quest to make the perfect Christmas breakfast and plan the perfect day has to find out the hard way what makes a perfect Christmas. You all know me well enough, I don’t have to give my bio but in case you are new to Grace on Parade, I’ve been writing and publishing since 1986. I’m working on writing my third novel. I’m so excited and proud to be included with the group of writers represented in Christmas Treasures: A Collection of Short Stories. We will be announcing soon when and how you can get your own copy of this wonderful anthology. In the meantime, keep checking back at Grace on Parade for more holiday food stories and recipes. Not every extended family is created equal. The holidays are fast approaching. If you are like most families, you are already making plans for the holidays. Who will you spend Thanksgiving with? Who is coming to your house for Christmas? Who did you spend Thanksgiving with last year and have you given enough time to this relative and . . . why can’t we just stay home and enjoy each other? could have gorwn up surrounded by grandparents, cousins and aunt and uncles, visiting relatives on the holidays was a seldom enjoyed luxury. We were able to develop our own traditions, eat the food we wanted, open gifts the way we wanted and use the holidays as a time to relax. Now that we are on the other side of the child rearing years, we realize what we have missed. 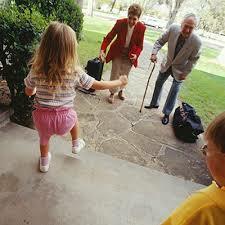 As our parents age and time draws near for them to leave this earth, we find ourselves tempted to grab a tally sheet. Have we spent enough time with each side of the family? Should we have spent more time with certain people? Better go see so-and-so – we may never get another chance! Did we let our girls spend enough time with different family members? Once our girls start families of their own, what will we do if our daughters can’t come home for a holiday? As we wrangled over this recently, I thought about our attitude toward our girls when they were growing up. Jack and I had an “equal but different” philosophy. Every parent is tempted to try to keep things equal. If Johnny gets a bike, so should Josie. Sam got a cell phone at age ten so Stephanie expects one then too. You let Jessica take piano lessons, why can’t I take piano lessons, whines Jennifer. Keeping everything equal quickly becomes impossible and foolish. Why? Because every child is different. Sam may be more responsible at age ten. Maybe he had after school activities that necessitated having a cell phone so he could call home. You didn’t let Jennifer take piano lessons because she was in the band and played the oboe. With our girls, we looked at their gifts, their maturity level, their activities, and their needs. We then made decisions accordingly. We also looked at our finances, where we lived, what opportunities were available, and what else was happening in our lives. Since we only had one driver in our family – my husband who worked many hours like any minister does – we had to make some hard decisions and limit the girls’ activities. We made the best choices we could at the time. The “equal but different” policy applies to extended family too. You can’t treat both sides of the family the same. You equally love them but you have to treat them differently because they are different and they are surrounded by different circumstances. You might live closer to one side of the family. One mom might have greater health issues. One set of parents may just make it difficult to communicate with them. One side of the family may not be able to house you, making it necessary to stay in a hotel you can’t afford. Sadly, there may be family members it is best to avoid letting your children have a face-to-face. The dynamics become even more complicated with second marriages and dual custodies. You make choices in order to compensate. You call one mom more but visit the other one more because you’re closer or there are specific needs you have to attend to. You send gifts in the mail to your sister’s family but send a check or gift card to your mother-in-law. Equal – but different. Each according to what they need. Each according to their unique personality. (Yes, families as well as individuals have personalities!) Each according to their availability and unique set of circumstances or family dynamics. Jesus did this for us. He treats us, not according to the next person, not according to what we deserve or don’t deserve, but according to what is best for us and what we need. He uses us according to the gifts He has given to us. Jesus treats us not how we deserve but according to what we need. How will you best live this moment with those God has given you to love? Most important, how will you celebrate the holidays in a way that best honors God and celebrates all His gifts, particularly His Son Jesus Christ? Take your eyes off your family and consider, what will you do for Jesus? After all, it is all about Him. What are your holiday plans? Share with us! Give us creative ideas of how we can reach out to our extended family.